Looking for suggestions on which games to give as gifts or add to your own list this year? Here’s a few recommendation lists you should check out! Also included in Taco’s list are some of this year’s heavy hitters from other publishers such as Terraforming Mars, Gloomhaven, and Pandemic Legacy Season 2. We’re honored to have Element among such beloved company! And, at $34.99, Element is a great price point for the family or work gift exchange. This guide is a look at some of “the year’s best tabletop entertainment” and is broken down by categories that include Dice Games, Family Games, Strategy Games, and even Gaming Accessories! So much goodness. Check out the full list on Under Radar’s website. Most of our fellow industry professionals are also gamers at heart, so we take their recommendations seriously. Phil Lacefield of Golden Distribution pulled together a great list of game and geek-related items he has seen this year that he is very excited about. We are honored that Hafid’s Grand Bazaar made the list and are pleased that Phil has honed in on what makes this game special in a sea of bidding and trading games. We hope you find something you like on these lists. 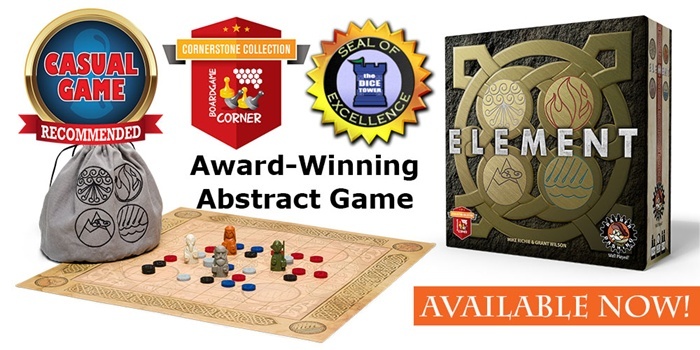 If you are interested in Element, Hafid’s Grand Bazaar, or any of our other games, we invite you to learn more on the Game pages of our website. Order through our web store by December 10 and take $10 off your purchase of 2 or more games when you use code GAME10 at checkout! Or visit your Friendly Local Game Store to get a copy today.